Even if you’ve never been a Sky TV customer before you’re probably somewhat familiar with the old Sky+ box, which not only provided access to satellite TV broadcasts but had a hard drive for recording TV, allowed you to pause and rewind live broadcasts and featured integrated catch-up and on-demand players for streaming content. Sky Q is the replacement for Sky+. It too has a hard drive and streaming functionality, but it improves on the old Sky+ boxes in every way. If you buy a new Sky TV package now you’ll receive a Sky Q box as standard. But what does Sky Q offer and how do you go about choosing the right Sky Q box and channel bundle? Read on to find out more! What is the Sky Q box? Sky Q is the latest high-tech replacement to the standard Sky+ TV box that's been around for several years. Sky Q offers the same functions as Sky+ but has new features of its own, and a smart new design. What features does the Sky Q box offer? So what’s new with Sky Q compared to the trusty old Sky+? First off, the box itself is slimmer and slicker. Not a big selling point admittedly, but it does look great under a modern TV! More important is the overhauled user interface. The UI is now more responsive, and has been designed to make it easier than ever to find new shows and get updates on the latest news and sports. Sky Q also now supports Ultra HD so if you’re lucky enough to own a 4K TV set you can enjoy movies, TV shows and sports with incredible detail and colour. Sky Q boxes also have larger hard drives for storing even more of your favourites, and you can continue watching outside the home or on a mobile device by using the Sky Q app to download recorded content. Even the remote has been upgraded. The new Sky Q touch remote has an intuitive touchpad, and uses Bluetooth instead of infrared so it doesn’t need to be pointed directly at the box. And if you have a Sky Q 2TB box you can quickly find a lost remote by pressing a button to make the remote beep for 30 seconds. What are the Sky Q box specifications? Record more than 1000 hours. Record four shows and watch a fifth live. Includes Sky Q touch remote with lost remote feature. Supports Ultra HD (4K). Used for Sky Q Multiscreen. The capabilities of recording and other smart functionality varies depending on the main Sky Q box. Also acts as a Wi-Fi hotspot with Sky Broadband. What TV do I need for Sky Q? At minimum you will need a TV which supports HDMI input and a resolution of at least 576p. However for the best experience your TV should support a resolution of at least 720p in order to view HD broadcasts. And to make use of Ultra HD you will need a newer model with support for 2160p (aka Ultra HD/UHD or 4K). This should not be a barrier if you’ve bought a set any time in the last decade as TVs have commonly supported at least 720p and HDMI for some time now. To confirm, consult the manual or search for the specifications online. If you’re buying a new TV make sure it supports at least 1080p (though any lower would be unusual now). And if desired, 4K/Ultra HD support for future proofing. For more information about Ultra HD and 4K consult this useful guide from TechRadar. Which Sky Q box is right for me? As you can see above, both Sky Q boxes share similar specifications in terms of inputs, outputs and networking (with support for wired Ethernet or Wi-Fi). The two major differences between the models is hard drive space and supported resolutions. In many cases, the Sky Q 1TB box will be more than sufficient. It has enough space for 500 hours of recordings and displays 1080p high definition, which is going to be the maximum resolution many TVs can handle. If you require more recording space or you have a 4K TV and wish to view Ultra HD broadcasts, choose the Sky Q 2TB box. However, do note that in order to get Ultra HD channels you must also sign up for Sky Q Multiscreen. With Sky Q, multiroom support is built right into the box making it easier than ever to install Sky TV in any room of your home. Sky Q Mini boxes are used to bring coverage to other rooms, and as they connect to the main Sky box wirelessly there’s no hassle with aerials or other cabling. 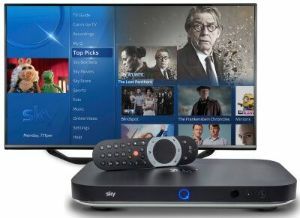 A Sky Q Mini box offers access to all the same content as the main box. In addition to viewing live broadcasts, they can also be used for catch-up and on-demand viewing and to access recordings stored on the Sky Q hard drive. In order to use this feature you will need to sign up for Sky Q Multiscreen, at a cost of £12 per month. For this price you’ll receive one Sky Q Mini box; additional boxes are available for a one-off fee of £99. The service supports up to four Sky Q Mini boxes, though live viewing is restricted to a maximum of one screen with a Sky Q 1TB box, or two screens with the Sky Q 2TB model. For more information about this useful feature read our guide to Sky TV multiroom. What Sky Q offers and bundles are available? Sky Q deals are flexible, allowing you to choose from one of three base packages and then further customise them with additional channel bundles and features as required. You’ll also receive a selection of free extras. Sky Go allows you to view live TV in the home on a compatible laptop, tablet or smartphone, and watch on-demand content outside the home. Catch-up TV is available for popular channels such as SyFy, Sky Living and Fox for up to 30 days. And of course all Sky Q offers give you access to the standard selection of Freeview broadcast channels and catch-up players for BBC, ITV, Channel 4 and Channel 5. Sky Q packages come on a 12 month contract, however extras such as channel bundles can be added and removed at any time without penalty. The entry level Sky Q deal is £20 per month. It gives you over 30 premium channels (270 in total), including Sky Atlantic, Sky 1, Fox and SyFy. For £32 a month (or £9.50 extra to existing customers) you’ll gain access to more than 300 channels. This includes the same choice as the Original bundle, plus documentary channels like Discovery and History, MTV and VH1 and a selection of kids channels such as Disney and Cartoon Network. Also includes 4,500 kids TV episodes on-demand and the Sky Kids app for tablets. TV addicts will love the Sky Q Box Sets bundle. This one is £38 month (£6 extra for existing Sky TV subscribers) and provides more than 350 channels, including 50 in HD, alongside more than 350 TV box sets to view on-demand including The Walking Dead, The Wire and The Blacklist. Are there any extras with Sky Q? 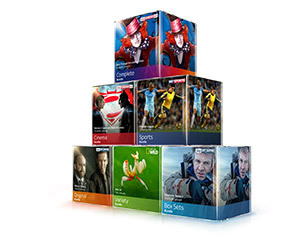 The base Sky Q packages can be further customised with two great premium packs for even more unmissable entertainment. Adds 11 movie channels in HD, with a new premiere every day and more than 1000 movies to watch on-demand. £18 per month. Get access to ten Sky Sports channels, with 126 live Premier League games. £27.50 per month. Asian drama, comedy, entertainment and Bollywood movies with seven channels, including Sony Entertainment Asia. £15 per month. A must for Chelsea fans. Dedicated coverage, live pre and post-match coverage, on-demand highlights and exclusive extras. £7 per month. The channel for Liverpool FC fans. Additional pre and post-match analysis, live games, exclusive interviews and live news. £7 per month. Exclusive coverage, interviews and features for Man U fans. Includes documentaries and classic matches. £7 per month. Get access to more top shows and movies on-the-go. Download to a compatible laptop, tablet or smartphone and watch offline. View on up to four registered devices. £5 per month (or free with Sky Multiscreen). As well as its TV offerings Sky is one of the UK’s leading home broadband providers. Sky Broadband packages include unlimited usage and offer speeds up to 17Mb (ADSL) or 76Mb (fibre optic). You don’t need Sky Broadband to use Sky Q, but getting both in a bundle can be cheaper than using separate providers, and you’ll benefit from some additional features. When connected to Sky Broadband, your Sky Q box and Mini box can act as Wi-Fi hotspots, extending coverage around the home. And you’ll also get free access to The Cloud, Sky’s own Wi-Fi hotspot network with more than 2,000 access points.